Little M and I were lying around chatting this weekend when we decided it was time to get moving. She wanted to play hopscotch and I thought it would be the perfect time to throw in a math activity. Her first grade class has spent quite a bit of time working on addition and she loves every minute of it. Memorizing math facts is great BUT kids also need to understand how these facts come together. 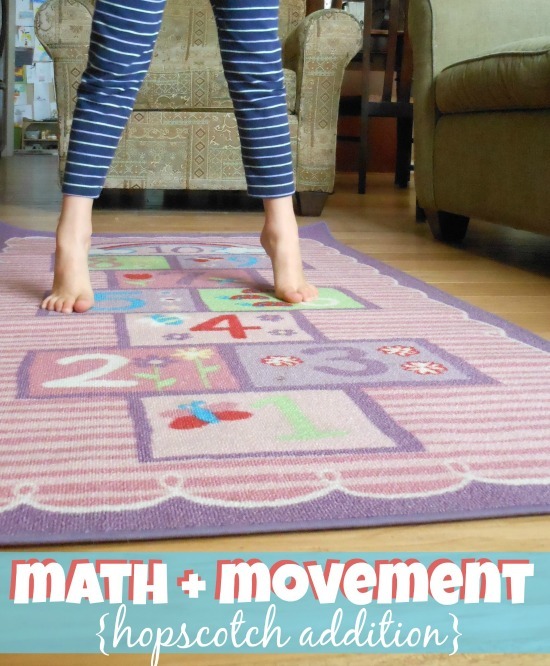 Our little math and movement game forces kids to think about every step of the equation… in a really fun way. Once you have your hopscotch ready and your little one has had some fun hopping back and forth, it’s time to add in a little math. Start simple. Ask your math whiz to hop on the numbers that add up to 10. It took Little M a minute to understand what I meant. If you have to, do a little hopping of your own as an example. Once they get the idea, continue calling out numbers while your kid bounces back and forth. Tip: If this is too challenging start with smaller numbers and make sure to mix addition facts they know well with ones they have to think about. This will make sure they are getting plenty of “wins” so they stay engaged longer. Serious thinking. (And a very impressed Mom). After quite a long time of hopping and thinking, I decided it was time to up the challenge. I think she even impressed herself. This part requires some serious thinking. Ask your little one to make a sum of 15 using 3 numbers. And then using 4 numbers. And then 2. Change the sum and the amount of numbers they’ll use to get it. Repeat and repeat and repeat. Eek! Honestly I get so excited when learning comes together as well as our math and movement activity did (are you surprised). We played this for an hour and she insisted we play again first thing the next morning. This is so great! I’ve pinned it to try out with my kkids! 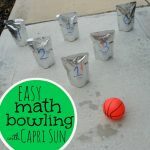 This is a great activity to really help teach math. It keeps my girls active and learning at the same time. Not a bad exercise! Thanks for the post!